The Central Virginia Food Bank needs donations! This Saturday, November 3rd, the Boy Scouts will be Scouting for Food – Fill your paper bag (dropped off by the scouts last week) with canned/non-perishable items and leave it on your doorstep for pick up. Have you spotted any bargains that would be perfect for donations?? $173.53 in food items for a total of $37.97 out of pocket! My portion was $45.49 and I spent $9.38. Eleanor won with $46.63 for $8.81, Tiffany $36.85 and $44.56 from Ann. All of our collected items went to the Central Virginia Food Bank. Rising food prices? While I certainly didn’t do everything I could, we all agreed the store sales were not nearly as good as last year. We’ve got another challenge starting tomorrow 1/8, and as usual, you’re invited to join in! We’ll be collecting toiletries and personal care products on a $10 budget. This challenge will run through January 24. We’re still figuring out the charity we’ll be supporting. If you’re interested in participating, email me at richmondbargains at gmail dot com so I can keep you in the loop. ‘Tis the season for canned good sales at the grocery store, so it’s the perfect time of year to stock your pantry AND the Food Bank! As with the school supply challenge in August, some other local bloggers and I are organizing a frugal food drive challenge during the month of November: How much non-perishable food can you collect with only a $10 budget? Everyone is invited to compete; all the results will be donated to the Central Virginia Food Bank. The challenge kicks off this Sunday, October 30 and runs through Tuesday November 29. You’ll find all the details, rules, and spreadsheet needed to track your purchases listed on the RVA Coupon Pros Facebook page. 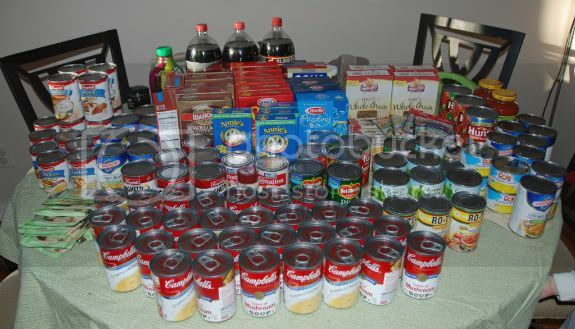 Here is what we collected in the challenge last year – $377.78 worth of groceries for $48.16! Put your coupon prowess to the test and join us in helping a great cause!